Note: There are two Dukes BBQ’s in Orangeburg. This review details our experience at the Whitman Street location. There is a different Dukes on Chestnut which we have yet to try. Heather talked me into driving up to Orangeburg today after she got off work since we had time for a quick road trip. Camden did not accompany us as he wasn’t feeling well, so we set out for a meal. I was kind of excited to try Dukes. 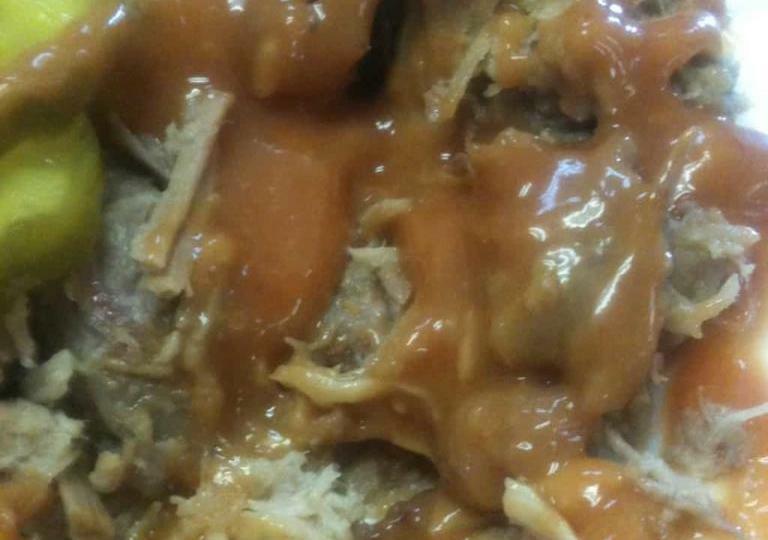 Now, one thing you need to know is that there are many Dukes BBQ’s in the Lowcountry. Heck, out of the blue, we passed one in Ridgeville on the way back. I know there is one on Spruill Avenue in Charleston, one in Walterboro, apparently one on James Island, and I hear there is another in Orangeburg, itself. I think they are all loosely related, but they are not franchises or part of a chain. Anyway, we arrive at about 4:30 and hop out. The building is a nice one compared to many we have stopped at. It has a walk-up take-out window on the side. The front is wood-sided with red doors and trim and wooden shingles. The interior is sparsely decorated. “Small town country buffet,” Heather commented, not being derogatory. There are lines of tables arranged around the room almost like a school cafeteria might be. Each row of tables has pitchers of sweet tea, hot sauce, and salt and pepper shakers. Around the interior, you will find t-shirts on a rack for sale ($15), used books on a bookshelf for sale (.50), and flower-strewn crosses for sale ($12). Frankly, it felt sort of Goodwill meets BBQ restaurant. Strange choice, but hey, we don’t care; we’re here for the BBQ. We walk up and order two buffets ($18). On the buffet there was: hash and rice, green beans, baked beans, mac and cheese, something akin to hush puppies, a fried something (gizzards? ), BBQ chicken, fried chicken, chopped pork BBQ, coleslaw, potato salad, pickles, sliced white loaf bread, a squirt bottle of ketchup, one of vinegar/pepper sauce, and a huge warming tray full of mustard sauce. Strangely, I saw no desserts anywhere. We filled our plates and sat to eat. The BBQ had no sauce on it, which we prefer. I have to say the first thing that entered my mind going through the buffet was that the BBQ was really dried out. Honestly, I considered the fact that since we were here early on a Thursday, opening day for the Dukes each week, that the BBQ we were being served was actually leftovers from the week before. I don’t know this to be the case, but I certainly suspect it because it is clearly dried out. Anyway, because there is no sauce, we are able to taste the meat itself. In this case, there was little taste. “My BBQ was dry. Didn’t have much flavor,” we both agreed afterward. I will say, however, that I got a second serving and the meat that had been added to the pan was much moister. We also purchased a pound to bring home to the kids. We tasted that when we got home, and I thought it had considerably more flavor, but Heather disagreed. Regardless, the BBQ itself was a disappointment for us, I have to say. We don’t believe Dukes uses wood coals but cooks with propane. This is based on the taste, the propane tank in the back and the absence of wood anywhere in sight… but mainly on the taste. Ironically, neither of us realized at first that the big vat of caramel-colored goo on the buffet was their famous sauce. Looking for sauce, I searched the bar and found two squeeze bottles. I grabbed one and squeezed out what was obviously was ketchup upon a plate. Into a separate section of the tray, I squeezed what was a very thin vinegar-pepper sauce and returned to the table, not knowing yet the mustard sauce was available by the ladleful on the buffet. The mustard sauce was interesting. Sweet. Very thick. More condiment than BBQ sauce. It literally sits on top of the BBQ when poured upon it. We agreed it was the best mustard sauce we’ve had so far, but again, we really didn’t love it. “I never realized how much I like vinegar-based BBQ until we started doing this. It’s just so much better,” I said on the ride home. The sweetness of the mustard sauces we’ve had tends to overwhelm the taste of the pork. Still looking for that perfect mustard sauce at a restaurant. As for the sides, here is our conversation: “The baked beans were just baked beans. My first thought was that they were straight out of a can,” I said. “Yep…and obviously the green beans looked like they were straight out of the can; didn’t eat ’em. The mac and cheese looked really dry; didn’t want to try that,” Heather said. I agreed. “The potato salad was good,” I said. It was tangy and smooth with a bit of mustard in it and pickles. “The fried chicken was great: moist, tender and crispy,” Heather pointed out. I agreed. Ironically, there were no desserts to be found on the buffet. Guess the meal was sweet enough on its own. So, bottom line: Was it worth the trip? “I’m disappointed… No.” I said. “Glad we tried it. Wonder if others are the same. No, I wouldn’t go back,” Heather said. Tags: Buffet, Dukes BBQ, Mustard, Orangeburg, Whitman St. Thanks, Tom. Will do. Our touring has slowed and our reviews have virtually halted, but we’ll get there one day. No, it hasn’t dissuaded us from trying the others. It is our duty to give each one an honest chance. Glad to hear that the Ridgeville shop is using wood – makes a true and clear difference. We’ll check it out in time. It’s on the list. Thanks, again. Being something of a barbecue junkie, and having been to all of the Duke’s locations, I’ve got to say go to the one in Ridgeville before you write off Duke’s as a barbecue joint. They are all loosely related by blood, but the product and presentation is very different from location to location. Ridgeville cooks with wood, has some of the best barbecue and fried chicken around, and also loads up the buffet with some really good cobbler-type desserts.